So, I started the “Allowance Project” with my K’s this year (if you don’t know what that is, check out this post from the past), although I tweaked it to making the giving portion more concrete. Instead of having the kids choose money to donate to a cause–which is nice, but not easy for young children to directly grasp–I decided to have them buy items for the food bank with their pennies. It’s really simple (and effective)! 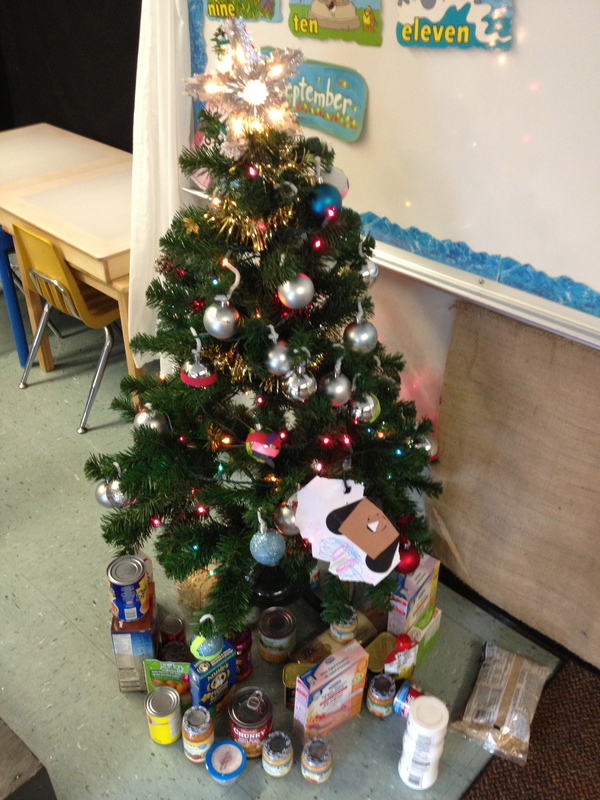 First, I asked the parents to send in donations for the food bank. Second, I put up a little Christmas tree. On Giving Day (which was today), I placed food on tables around the classroom and empty containers labeled with the price of each grouping of food. The children are allowed to buy one or two items with their pennies. “One or two” is a good condition for spending, because they end up with some interesting decisions to make. Should I buy an expensive item? Two less expensive items? How much can I afford anyway? Would I like to have some pennies left over? After children have made their purchases, they quickly journal what they bought and list the cost. Then they place it under the Christmas tree. This final step helped my children understand clearly that they purchased it (or them) as a gift for others. At the start, a few had a hard time with the idea of spending money on others. My line is, “In Kindergarten we practice being good, generous Canadians. It’s okay if it is hard…you just need some practice and it you’ll see that it is not as hard as you think!” This helped, believe it or not. In the end they all willing purchased items and were proud to see the result of their generosity piled up under the tree. I plan on doing this at 2 more times before the holidays. It is a wonderful activity on many levels! « Awesome Idea of the Week: Mortars and Pestles!